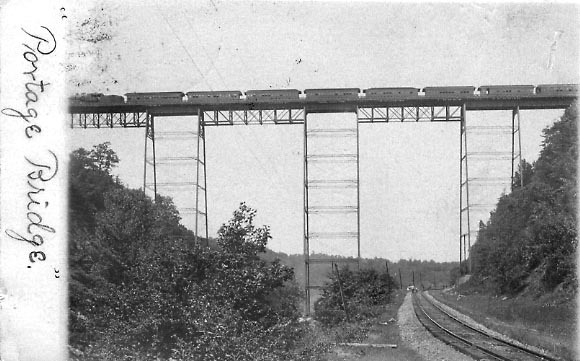 This view is taken from the bed of Pennsylvania Railroad looking north towards the Portage Bridge. The tracks leading away from the photographer belong to the "Pennsy" - the train on the bridge are on the Erie Railroad line. The Genesee river is hidden by trees and brush to the left. If you look closely, you can see tourists walking along the track. The card is postmarked July 21, 1908, and the sender noted that "the excursion train is on the Bridge". For more information see our Glimpse of the Portage Bridge.